New and increasingly strict state and county voting laws are threatening to cut off a growing number of Americans from their right to vote as primary season opens. 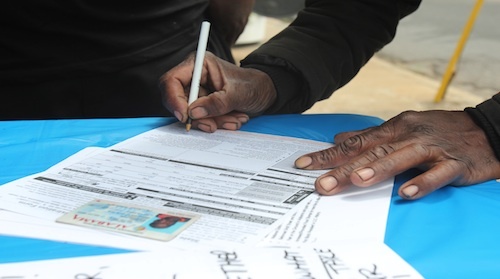 Ethnic minorities are disproportionately affected by lack of access to polling sites, voter ID requirements, and lack of language assistance, just as experts claim these groups are gaining political clout. Since the 2010 elections, 20 states have passed voting restriction laws, most often requiring citizens to provide photo ID before voting, minimizing early voting time, and in some cases blocking entire swaths of voters–such as those who have been convicted of a felony–from voting at all. Some of the laws will go into full implementation for the first time in 2016. The surge in restrictive laws intensified in 2013, when the Supreme Court deemed Section 5 of the Voting Rights Act unconstitutional. The rules in the section were designed to address the problem of racism at the polls by, for example, forbidding literacy tests from being used as a prerequisite for voting, and by imposing federal oversight in districts with a history of racial discrimination. · Florida’s harsh voting laws regarding former felons disproportionately affect the state’s African American population: 20% of the Florida’s black voting-age population are banned from the polls. Without the clemency of the governor, a felony conviction negates a Florida citizen’s right to vote permanently, even if the felony is a nonviolent drug offense. The harsh policy–which was briefly reversed in 2007 after Democratic former Gov. Charlie Crist took office–was reinstated by Republican Gov. Rick Scott in 2011, and affects an estimated 1 in 10 Florida residents. · In South Dakota, Native Americans living on reservations have long faced a barrier to voting due to the prohibitive distances voters must travel to cast early ballots. The 2002 Help America Vote Act (HAVA) provides states with federal funding to meet minimum election standards, but Buffalo County in South Dakota has resisted using the federal funding to set up accessible satellite offices for early voting. Eligible Native voters living with disabilities or who don’t have vehicles and gas money are left without options. Native voting rights activists in South Dakota and Montana have pressed lawsuits against counties with similar policies. · Latino voters have been challenged at the polls by multiple states demanding proof of U.S. citizenship as a requirement to vote. This regulation was first put into place in 2004 by the State of Arizona, but was struck down by the Supreme Court in 2013. The court ruled that the law violated the constitutional ban on poll tax since voters without ID were required to pay fees for obtaining government-issued ID cards and documentation in addition to the sometimes considerable transportation costs needed to travel to the nearest DMV. Arizona has appealed the ruling, but for now has two lists of voters: those eligible to vote in federal elections but don’t meet the requirements for state elections, and those who are eligible to vote in both. · The language assistance provision of the Voting Rights Act has provided important protections to Asian American voters across ethnic communities. According to the law, voting districts with large populations of voters who speak a language other than English and have low English proficiency must receive language assistance. This assistance includes allowing voters to bring a translator of their choosing into the voting booth. The Texas Election Code has been sued for violating this requirement by forcing voters to use translators who are registered to vote in the same county, effectively limiting the pool of translator’s the voter may choose from. Restrictive voting laws continue to proliferate even as the pool of ethnic voters is expanding. The 2016 elections will be key to understanding whether these laws passed in the name of preventing fraud will discourage vulnerable voters—especially ethnic minority voters—from going to the polls.